2018 is here and I hope it brings lots of happiness and progress to us all. Today marks 10 years since I started Pearl Kreations from my bedroom in 2008! Yay! I thank God the business is still standing and thriving. Time flies though. As has become tradition, we will be rolling out lots of cool buttons this year, in accordance with the awesome movies coming out. If you’re a movie buff and buttons lover like I am, I bet you can guess the buttons we have planned. 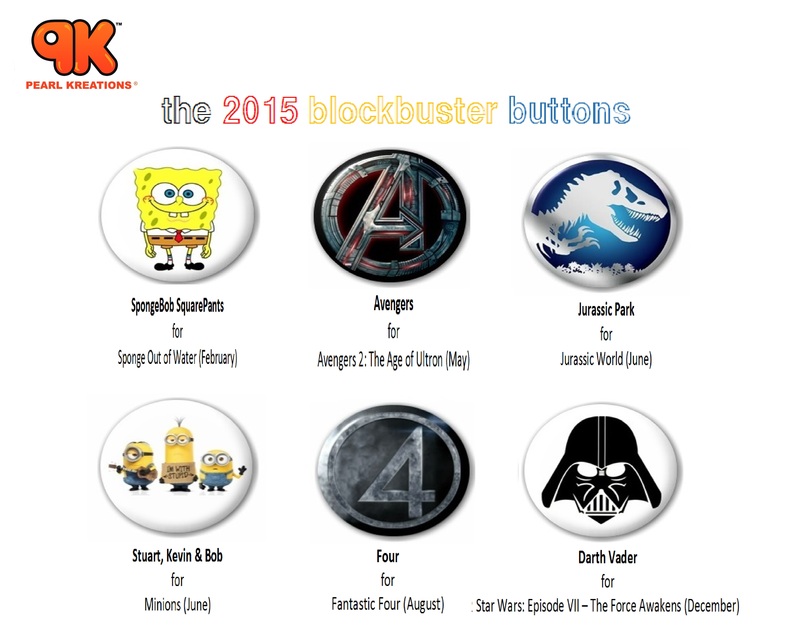 We will hold the collection strategy this year because Marvel Studios has the biggest buttons line up – 11 of the 14 buttons – for the most anticipated movies for the yea. Without further ado: The first/top row features two (2) proofs for two (2) blockbusters – Black Panther for Black Panther, and Avengers: Infinity War, and Deadpool for Deadpool 2. The second row features four (4) proofs for one (1) blockbuster – Mjöllnir, Iron Man-Mark V Arc Reactor, Captain America Shield, and Spidey for Avengers: Infinity War. The third row features five (5) proofs for three (3) blockbusters – Eye of Agamotto, Guardian, and War Machine Arc Reactor for Avengers: Infinity War, Ant-Man for Ant-Man and The Wasp, and Venom for Venom. The fourth/bottom row features three (3) proofs for three (3) blockbusters – Jurassic for Jurassic World: Fallen Kingdom, Predator for The Predator, and Aquaman for Aquaman. All collections will be available for purchase via our Online Shop and Konga.com Store. We’re also planning a special sale during the course of the year. Please follow Pearl Kreations’ social media handles for more information. We’re planning a one-time special offer for the month of May which we’re calling “The May Special”. You’ll be able to pre-order the entire collection between May 1st and May 10th via email. It will be sold at a discounted price, and deliveries will be made on or before May 28th. After the special ends, following the new arrangement we started in 2014, the buttons will be individually released in our online gallery and the online stores on the dates the movies premiere (in Canada) as listed above.